A CERTAIN SKILL SET – In this file photo, local orienteerer Jennifer MacKeigan competes in a sprint championship event. MacKeigan is in Latvia preparing to represent Canada at the World Championships. The 25-year-old Whitehorse woman is in Latvia about to represent Canada at the World Orienteering Championships beginning Saturday and running through to Aug. 11. A veteran orienteerer of 10 years, MacKeigan will be participating in the sprint, middle and long races. 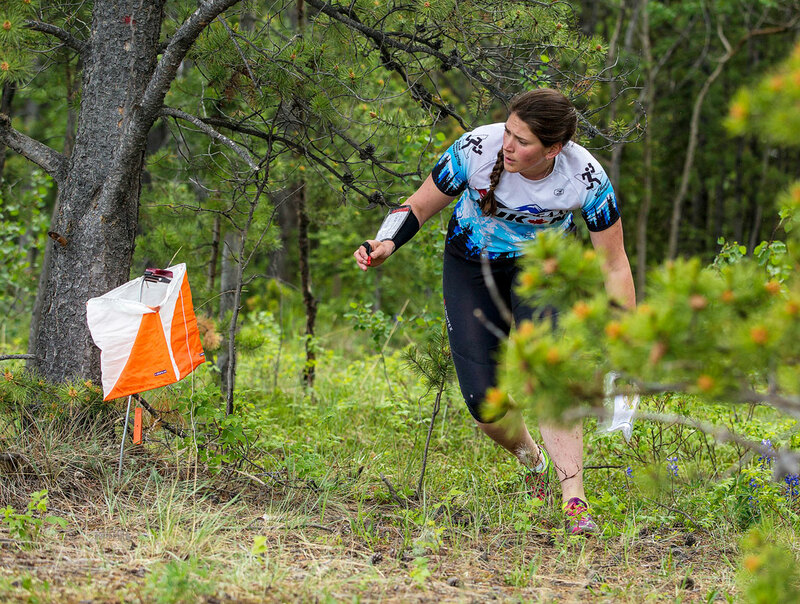 It’s a bit of a lead-up to the North American and Canadian Orienteering Championships being hosted by Whitehorse from Aug. 18 to Aug. 24. Joining MacKeigan to represent Canada will be 34-year-old Will Critchley of Edmonton who is currently living in Finland, 28-year-old Damian Konotopetz of Calgary and 27-year-old Graeme Rennie of North Vancouver. It’s expected more than 300 of the top athletes from 50 different countries will be in Latvia. MacKeigan was part of Orienteering Canada’s 2018 high performance program. She said her goal is to be happy with her performance after each race. MacKeigan said she’s only had a chance to see the forest from the train, but she’s looking forward to getting started. Pia Blake, another Whitehorse orienteerer, recently returned from representing the country in mid-July at the 2018 World University Orienteering Championships in Finland. In the 9.7 kilometre long race, Blake finished 74th in a field of 84 women, in a time of two hours, 15 minutes and nine seconds, or just over a hour back of the winner. Marie Olaussen of Norway won in a time of 1:13:18. Johanna Oberg of Norway was second, 41 seconds back. The Scandinavian countries are traditionally big on the sport of orienteering. In the mixed relay event, Blake joined with Canadians Emma Waddington, Adam Woods and Michael Kondro. They finished 18th out of 23 teams, in a time of 1:06:57, or 10 minutes behind the winning team from Switzerland. In the women’s relay, Blake and Waddington teamed up with American Brigette Bourdelon to finish 22nd out of 36 teams, in a time of 2:30:39, or almost an hour behind of the winning team from Norway. Afan Jones of the Yukon Orienteering Association says its highly likely many of the orienteerers from both the university championships in Finland and the worlds in Latvia will be in Whitehorse for the North American and Canadian championships. The events are open to all countries, he points out. Jones says doing well here comes with bragging rights no matter where the athlete is from. So far, he points out, there are 570-plus registered for the Whitehorse events, including orienteers from 15 or more European countries.